Last year I entered Samantha, our 3 month old lab mix puppy, in our local Howl o\’ween Parade. Since I just got her from the local ASPCA, I went to PetSmart and picked up a cute Bumble Bee outfit. When I got to the parade, there were four other bees. I looked around and saw that some of the costumes were absolutely angelic. I could sew, I could do something that was great like my grandmother used to do for me when I was young. The quest was on. What do I make my little girl? What category do I choose, superhero, funniest. No, only prettiest would do for my baby. I put her in coats all winter long so she would be used to wearing a costume when I needed her to wear it. My husband thought I was taking it to the extreme, but I wanted her to be the Belle of the ball come Halloween. So my first intention was to make her Belle. Then I was thinking a flower. The idea finally came when I was listening to an oldies station WCBS and I heard Copacabana. I found myself singing this song VERY loudly. That was it. I found what I was looking for. I went to Joann’s fabrics the next day and started looking at material. David Tutera Bridal Collection had a gorgeous peacock blue fabric and it was half off. Then onto AC Moore and found the matching feathers. I used her winter coat as a template and created the dress. The embellishments were a funny story. 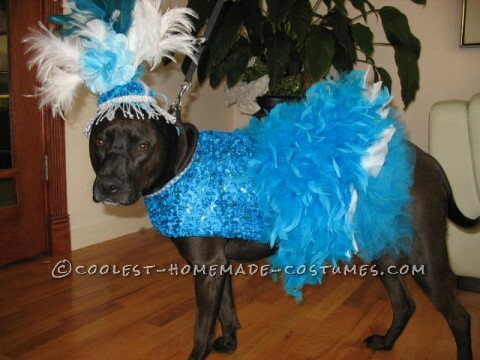 I work in a hospital and I brought in the costume, every day at lunchtime, I would hand sew the ostrich feathers. At one point, you could find a blue feather in the break room almost every day. I finished the feathers, flowers, beads and sequins in 3 weeks of lunches. My biggest challenge was the headpiece. I did not want to attach it to Samantha with elastic, I wanted it to look like a showgirl. Back to Joann’s… I found a piece of stretch velveteen fabric and made a headband with a velcro closure. I got a styrofoam half circle and covered it with the bridal fabric and stuck in feathers and beads, and completed it with silver fringe. My outfit was complete. All this for a mere $112 and about 32 hours of work. Samantha loves wearing her dress. She likes to show it off. When people see it, the first thing they saw is “awww”. When I tell them that she is a Copacabana Showgirl”, they all start singing… “Her name is Samantha, she was a showgirl”. Mission accomplished.